Rejoice all ye faithful! Warmist Extraordinaire, BBC News environmental expert journalist Mr Richard Black has started to grasp all that is wrong with AGW messages such “the planet is burning”, “humanity is in peril”, “climate change is a bigger threat than nuclear war”. […] if climate impacts are at present largely reversible but the loss of a species self-evidently isn’t, does that make biodiversity loss more important than climate change? […] if the fundamental drivers of all the trends are the swelling in the human population and our expanding thirst for raw materials, why aren’t these the things that politicians and environmental groups are shouting about and trying to change? The blog in question is titled “Does climate cloud the bigger picture?“. Perhaps he (and some among my twelve readers) will now understand why I simply cannot bear the constant barrage of absurdist climate change claims (shrinking sheep included). AND the BBC’s own fixation with all things global warming. IMNSHO, anybody that cares about the environment should be wary of overshooting remarks about any particular environmental issue: those will not help solve anything, and likely will make things worse overall. [ UPDATED 23:47 GMT: According to Singapore’s Straits Times, it was “Hundreds of environmental activists” marching in Australia. 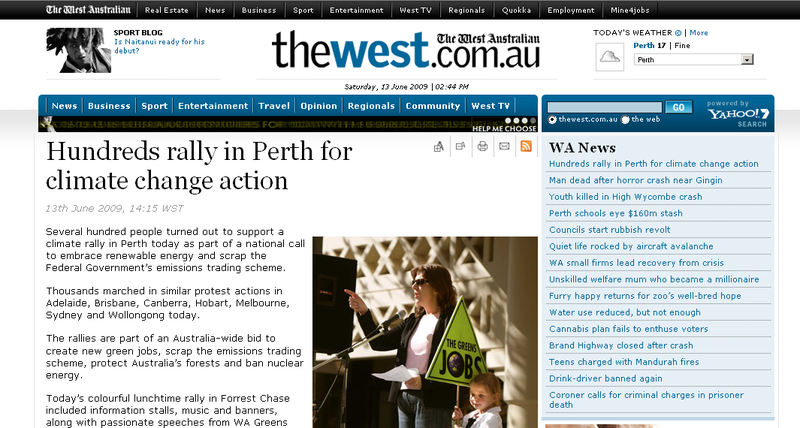 The Sydney Morning Herald focuses on Brisbane and “a crowd of 600“, after reporting that “thousands of environmental activists marched in central Sydney“. Finally, Melbourne-based The Age writes that “The rallies attracted about 6,000 people nationwide“. [ UPDATED 13:50 GMT: I have inserted the pictures grabbed earlier today. There is now an ABC article saying “At a protest rally in central Sydney, streets were blocked off as more than 1,000 people marched through the city streets to the office of Prime Minister Kevin Rudd“. And yes, it mentions just Sydney. There is also a blog (with a photo) claiming “Thousands marched from Melbourne’s State Library to the Treasury Gardens to demand more action on climate change“. To be perfectly clear, the point of this blog is not to ask if thousands have marched in Australia against climate change or not. Had the BBC reported manufactured news, that would have been fraud. Instead, the point is to ask on what basis did the BBC find it necessary to rush this kind of news first, and without having had the time to check what they were writing about. Or have they? Has Mr Mercer written his piece before the fact (could happen), and much worse, before having the information needed to verify the contents of his article? 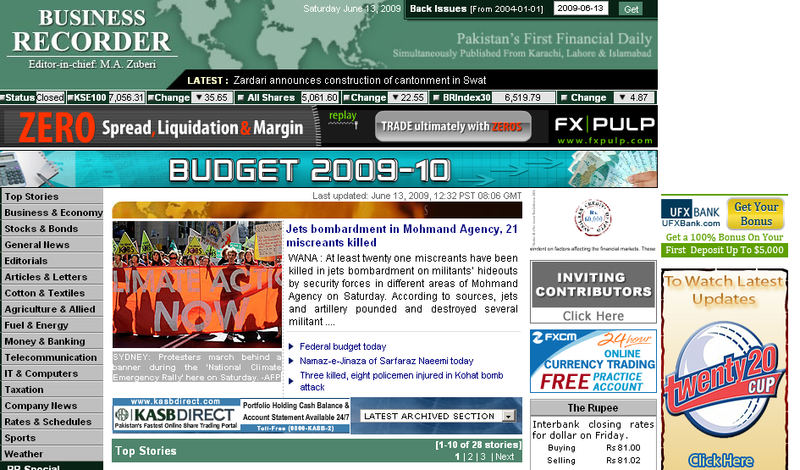 Mercer’s article as of now is timestamped as “Page last updated at 04:20 GMT, Saturday, 13 June 2009”. That corresponds to 2:20pm in places like Brisbane and Sydney. 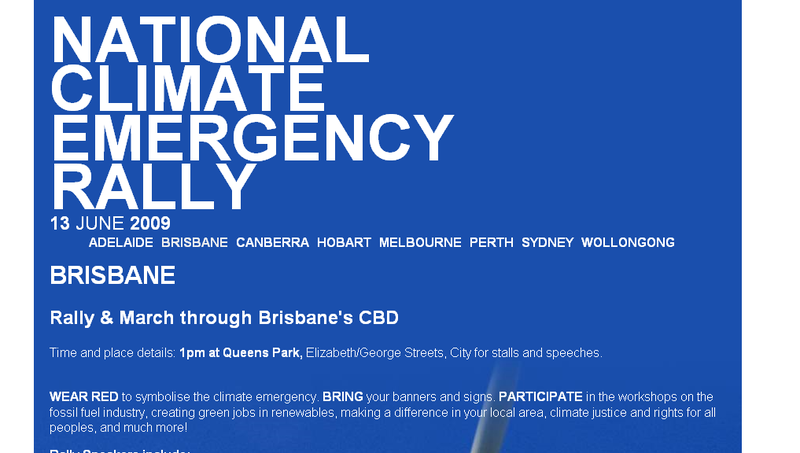 The National Climate Emergency Rallies were scheduled for 1pm Brisbane time. I suppose that could put Mercer’s article in the “breaking news” category. Notably, the AFP picture cannot be used to judge a crowd’s size. 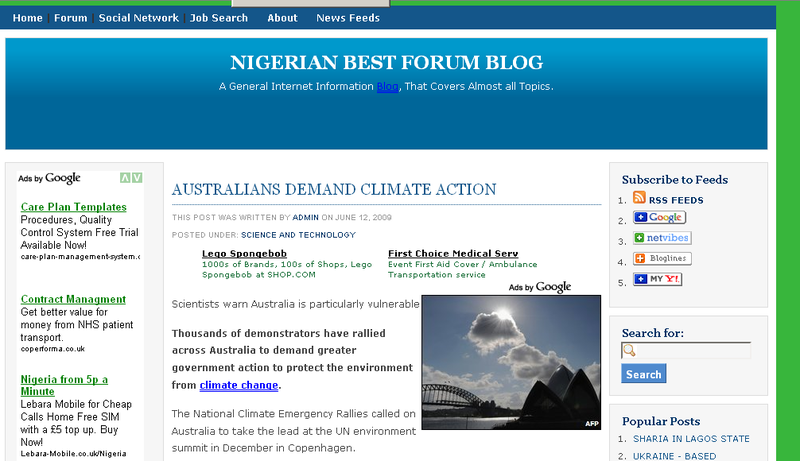 Even more notably, there is nothing as of now from Australian’s sites and blogs about “thousands of people“. In summary, BBC’s Phil Mercer’s “news” article has likely been pre-packaged with an “informed guess” using activists’ own estimates made long before any demonstration had taken place. 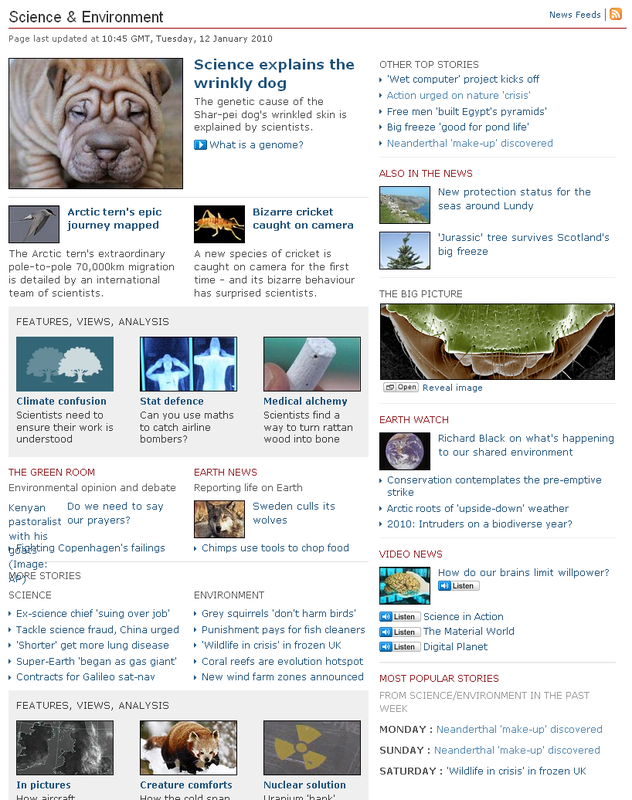 And it has been rushed up to appear as top “Top Story” in the Science & Environment page just in time for Britons to read early on Saturday morning: before any meaningful check about its content could be done. More: before any other major news media thought is meaningful to report about it. Google News, in fact, shows nothing else apart from what already listed above. Now…by what stretch of imagination can an organization rushing itself forward, with pre-packaged rathern than breaking news, present itself as reporting on climate change impartially and without a bias? Were this any other aspect of politics, BBC news could easily be categorized as a political outlet. Numerical evidence for Richard Black’s (hence, the BBC’s) biased reporting on climate can be found in the amount of space dedicated to the various arguments in the “appalling” article about Japan’s emission targets. The article is made of 469 words. Of those, 249 make up “neutral” sentences (54%). Negative comments are made of 156 words (34%). Only 58 words (13%…a mere three sentences!!) are left to explain the reasons for the Japanese government’s decision (see below for separate extracts). How many times does a point need to be made before falling into readers’ brainwashing, one asks? The target equates to a cut of about 8% from 1990 levels, the commonly used baseline. By comparison, the EU plans a 20% reduction over the same period. The announcement comes in the middle of talks on the UN climate treaty in Bonn. The Intergovernmental Panel on Climate Change (IPCC), the UN advisory body, has recommended that developed nations cut emissions by 25-40% from 1990 levels by 2020. Mr Aso’s target puts Japan roughly in line with the US. President Obama has pledged to bring emissions back down to 1990 levels by 2020, although legislation coming through Congress is likely to impose a target of about 6%. Last year, Mr Aso’s predecessor Yasuo Fukuda set a longer term target of cutting emissions by 60-80% by 2050, and indicated the 2020 target would be close to the EU’s. The US, and some EU nations, are determined that major developing countries such as China and India should adopt emission curbs. But they have repeatedly said they will not sign up to measures that could curb their economic growth, arguing that the developed world must lead the way. The two-week meeting in Bonn, which ends on Friday, is the latest in a series leading up to December’s key summit in Copenhagen, which is supposed to usher in a climate agreement to supersede the Kyoto Protocol, whose current emissions targets only run as far as 2012.
a figure derided by environmentalists as “appalling”. Some observers say Japan’s goal is not enough to persuade developing countries to cut their own emissions. “The target is not strong enough to convince developing nations to sign up for a new climate change pact,” said Hidefumi Kurasaka, professor of environmental policies at Japan’s Chiba University. But Kim Carstensen, leader of the global climate initiative at environment group WWF, said the 8% target represented virtually no advance from the 6% cut that Japan had pledged, under the Kyoto Protocol, to achieve by 2012. “Prime Minister Aso’s plan is appalling,” he said. Japan’s annual emissions are currently about 6% above 1990 levels, despite its Kyoto Protocol pledge to make cuts. To the chagrin of environment groups – who point the finger at lobbying from Japanese industry – this has not transpired. Announcing the target, Prime Minister Taro Aso argued it was as strong as the EU’s because it does not include “flexible mechanisms” such as international carbon trading. But the government points out that the society uses energy much more efficiently than other industrialised countries. Per-capita greenhouse gas emissions are about half the rates in Australia and the US. Many thanks to the BBC for (unwittingly?) underlying a case of pro-AGW bias on the AAAS ‘ flagship magazine Science , "the world’s leading outlet for scientific news, commentary, and cutting-edge research ". In a sentence, the Editors of Science appear fixated with AGW to the point of forgetting the non-AGW articles that somehow manage to surface in their magazine. The case consists of 2 "reports " ("brief communications"?) and 1 "perspectives " ("invited commentary"?) 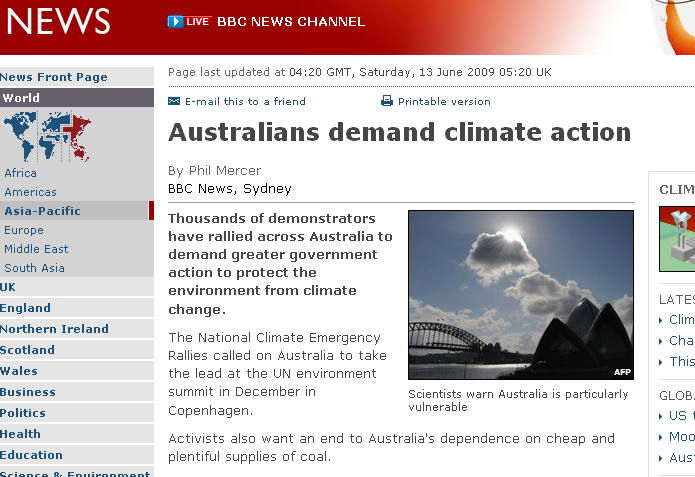 from the 8 May 2009 issue ; a little-known climate-change BBC blog with a (positive, free-minded) approach; and a sheepish attitude by the BBC "Science & Environment" staff in reporting news with no trace of any critical approach to the subject. Likely via an embargoed press release, word about (b) and (c) comes to the BBC, universally (in)famous because of the "importance the organisation places on climate change as part of the news agenda "
IMNSHO, the worst part of the above saga is when the authors of the invited commentary (c) do not mention the non-AGW report (a) at all. Now, we can of course pretend that it all happened by chance. Or we can choose the simplest explanation, using Ockham’s razor: the bias towards propping up the AGW theory is just very, very strong at Science magazine. There is simply too much very good evidence in that direction. Science 8 May 2009: 778-781. […] Our results suggest that the mixed layer’s response to regional variability in aerosols accounts for 69% of the recent upward trend, and 67% of the detrended and 5-year low pass–filtered variance, in northern tropical Atlantic Ocean temperatures. Science 8 May 2009: 791-793. […] We conclude that different populations of P. borealis [shrimp] have adapted to local temperatures and bloom timing, matching egg hatching to food availability under average conditions. This strategy is vulnerable to interannual oceanographic variability and long-term climatic changes. The northern shrimp, Pandalus borealis, makes up 70% of the 500,000 tons of cold-water shrimp harvested annually from the world’s oceans. Commonly captured in shelf waters deeper than 100 meters, it supports major fisheries throughout the North Atlantic. On page 791 of this issue, Koeller et al. (1) report that the reproductive cycles of most northern shrimp stocks are finely tuned to match the timing of egg hatching with that of the local spring phytoplankton bloom (see the figure). This remarkable degree of local adaptation on a basin scale is achieved by females regulating the initiation date of their temperature-dependent egg incubation period so that eggs hatch on average within a week of the expected spring bloom. Thus, in typical years, eggs hatch at the time of maximum food availability. The potential downside of this reproductive strategy is its sensitivity to climate-associated changes in the ocean environment. Stocks of northern shrimp, the essential ingredient in the ubiquitous prawn cocktail, could be badly affected if ocean temperatures rise. Researchers report, in the journal Science, that shrimp eggs hatch within days of each spring phytoplankton bloom – the main food source for the larvae. What's In It For Roger Harrabin? I am looking hard for reasons to believe that your “Climate scenarios ‘being realised‘” article has not been written with the intent of misleading the average reader. Committed to the Kyoto Protocol, New Zealand promised to cut its emissions to 1990 levels. The country’s biggest source is methane from cattle, and as Stephen Evans discovers, the issue is raising a stink among local farmers. I am seriously worried about the amount of fun people in the XXIII century are going to make, about us and our asinine (or shall I say, bovine) XXI century implementation of “targets”. I have devised a simple model explaining why the BBC is biased towards reporting pro-AGW stuff. And it does not involve a government conspiracy. Simply, the BBC cannot report impartially on climate change or a lot of any other issues for that matters. They will never, ever open a news bulletin by stating “Polar Ice is perfectly fine” or “There’s peace in Malawi”. The BBC journalists are bound by the way of their profession to go hunting for “bad news”: the only way global warming is going to disappear from their reports is for global cooling to kick off in some spectacular way. I am still waiting for a news item reporting that the summer 2005 drought in the UK has finished. They (the journalists, and editors) are simply physically unable to say a word about that. And if you want an example that is completely unrelated, just look at how house prices were spoken about when they were going up (”rising property values have priced many potential first-time buyers out of the housing market”) and now that they are going down (”thousands of Britons […] have lost their homes amid spiralling repossessions by mortgage lenders”). “Normality” is not news and nobody will ever write about “normality”. If it gets on the BBC, it has to be bad. The Harrabin-Abbess story has not died yet (here’s Bishop Hill on “Jo Abbess’s fifteen minutes of fame“; a video of Noel Sheppard on CNN’s Glenn Beck Show; and Melanie Phillips on The Spectator hardly containing her glee on the “emerging truth” of the BBC showing its pro-AGW bias for all to see). In the meanwhile, Freeborn John demonstrates that another BBC journalist, Richard Black, is not immune from that same reporting bias, in matters of climate change (Mr Black knows very well my thoughts on the BBC warming bias); in the process, Freeborn John exposes a curious stealth-editing BBC policy. Folks at “the Beeb” better play it safe on global warming for a few weeks now…because if something else just as fishy pops up, then I can already imagine huge anti-BBC blogging and journalistic armies will be unleashed.